The 40 foot Rainbow Mega Obstacle Course is eye catching and a great addition to any event or paty! The rainbow archway invites participants into the fun to explore and manuever through vertical and hornizontal pop-ups obstacles. Then, push through a wall of inflated columns, climb up the rock wall and finish with sliding down the slide to see who wins the race! Teh racer who reaches the end first wins! Keep challenging your friends to see who is the champ of the MEGA obstacle course! 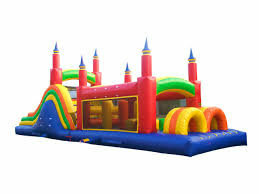 Fun for all ages and a great for any fair, festival, backyard rental or corporate event.